Nursery admission will be taken on 25-03-2019 between 8:30 a.m. to 12 Noon. For fee details please contact in the office during working hours. Annual examinations for classes I to IX and XI will commence from 19 February 2019. Lakshmipat Singhania Public School, Jaykaypur is declared as the best Co-Ed day school in Rayagada. It is placed #13 in Odisha and #275 in all India ranking of Co-Ed schools by Education World. The award ceremony will be held in New Delhi on 28 and 29 Sept 2018. Swachhata Pakhwada, a fort night program towards a cleaning mission, is being observed in the school and started with a oath taking by student and teachers alike. 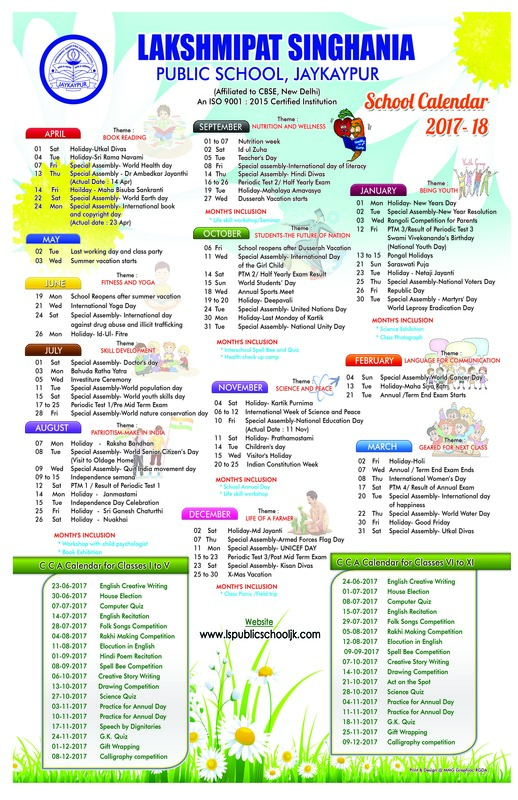 it is planned to be observed with different activities each day as designed by CBSE. Master Girija Shankar Dalapati Rai of class X got first prize in Quiz competition in Senior group. Miss Divyanshi Jindal of class 8 got first position in Hindi debate competition. Miss Sushree Sweta Nanda of class 4 got 3rd position in Quiz competition in sub junior group in Rayagada District. Lakshmipat Singhania Public School Jaykaypur won the “Gold Award” in International Cyberfair-2018 conducted by “GlobalSchoolNet.org”.